We were lucky enough to take part in the Notonthehighstreet ‘In Your Shoes’ programme. This entailed all the NOTHS staff getting to visit one of the 5000+ partners and spend a day in the life of one of the many small businesses that make up the vast online shopping site. We had Mark Cranton visit us in our studio for the day here in Stamford. Mark is a Senior Art Director and manages the photoshoots when all the products are called in. He had shot a few of our products so it was great to talk to him about this side of the business. 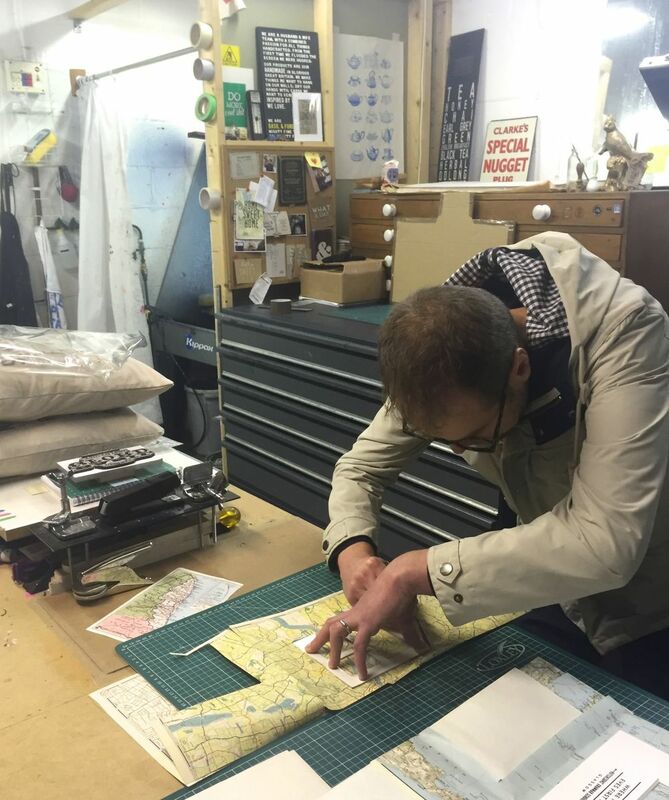 We wanted Mark to get the full B&F experience so he went through the whole process of creating our most successful NOTHS product, our 3 Map Wedding Print. We walked him through the whole process: (1) accept the order, (2) design the mount, (3) find the maps (4) create a PDF, (5) get customer sign off (6) make the positive (7) reclaim the screen (8) create the screen (9) hand screen print and finally (10) assemble, frame and package the print. And then, to give him the full B&F experience we took him to the best pub in town for a good pub lunch and a couple of pints. What a great way to spend a day! Mark also helped us print our first batch of Mighty Fine canvas bags and he then took the first one away to carry all his goodies home in.